Ron Evans (CHS 1955, representing the Nifty Fifties organization) went before the Collinsville School Board on May 9, 2005 to present the drawing at left prepared by Danny Pavey (CHS 1965). 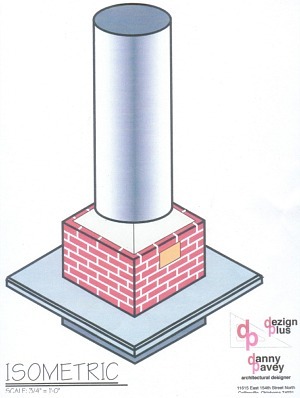 The drawing shows a presentation with a base (for seating and a plaque) that would hold a portion of one of the original columns from the Central High School built in 1912 and torn down in 1971. That high school building housed school students (7th-12th grade) until the spring of 1969 when high school students moved to the current high school west of town. The building was then used briefly as part of the middle school until it's demolition in the summer of 1971. Bill Thomas (CHS 1950) presents a check for $100 to Ron Evans (CHS 1955) from the Collinsville Education Foundation to help with expenses for the memorial. 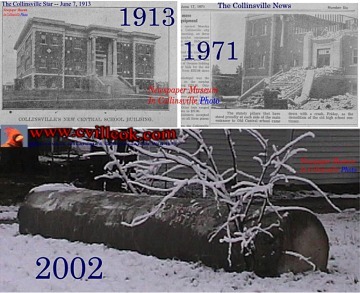 The column remnant is currently overgrown with brush, but hopefully will soon be prominently displayed back on it's old CHS campus. 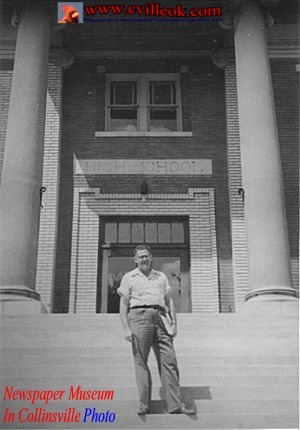 Howell H. Wilson, Superintendent of Collinsville Schools for many years, is shown on the front steps of the old Central High School in this undated photo (with the columns in place). This location would be about where the band room is now on the middle school campus.